If you send out your company newsletter or are planning to start one, this newsletter creation tip will help you build a visually appealing and responsive newsletter in minutes! It’s 2017 and the Internet has fundamentally changed the way businesses and customers interact. Status updates, likes, stories, tweets are a few of the many ways a marketer communicates with their customers or prospective customers. This, however, does not make our affinity towards email any less! Email is still a marketer’s best friend. Not just marketers, consumers don’t mind receiving emails too. A report by Statista indicates that 86% of consumers would like to receive promotional emails from companies they do business with at least monthly, and 15% would like to get them daily. Saying people love emails would be an understatement! Since email is the one channel that is constantly on the rise and the one customers embrace, marketers need to develop content strategies to make sure they make the most of it, without driving customers away. According to Hubspot, 78% of consumers have unsubscribed from emails because a brand was sending too many. Finding out just the right amount and sending segmented and personalized emails and newsletters are the key to unlock the true power of email. To make the most of email marketing, marketers turn to various email automation and analytics tools. The introduction of email automation has lead to a lot of cost-saving and time-saving in a way that was unimaginable a decade ago. Within six months of adopting marketing automation tools, 8 percent of companies see increased revenues. After one year of incorporating automation platforms, 32 percent report increased revenue. One such email marketing and automation tool is Mixmax. Mixmax is a tool that takes your Gmail marketing game to a whole new level. With powerful analytics, automation, and enhancements for your outbound communications, Mixmax truly attempts to make you a sales pro. You can also add interactive polls, surveys, web link previews, slideshows and can even schedule meetings within the Gmail message compose window. Everything Mixmax says it does perfectly. However, one of the most important aspects of an email marketing campaign is the use of email newsletters. According to the Content Marketing Institute, 83% of B2B marketers use email newsletters for content marketing. SO WHAT ABOUT NEWSLETTERS EH? Since newsletters are an integral part of every marketer’s email strategy, we decided to do something about it and came up with an awesome tool that lets you create beautiful and responsive newsletters in minutes! elink.io allows any marketer to create a visually appealing newsletter in a matter of minutes. It is the easiest and fastest way to create an email newsletter. The best part is the one-click integration of Mixmax and Elink.io. Let us walk you through the steps of integrating Elink.io with your Mixmax account. Step 1: Select a layout. Elink has a variety of visually appealing templates to choose from. Each template is responsive, so you don’t have to worry about the appearance of your newsletter on different devices with varying screen sizes. Copy and paste links to the content you want to share with your audience and elink will automatically generate a picture and a descriptive text regarding the link. Use elink.io’s Chrome Extension to quickly add links to your newsletter quickly. It’s a smart way to save relevant content across the web and start creating your newsletter as you go through your normal online life! Give your newsletter a catchy title. Choose “Header 1” template to add a header image and short introductory text. This is your opportunity to engage your audience. After publishing, go to your dashboard and select the newsletter button. 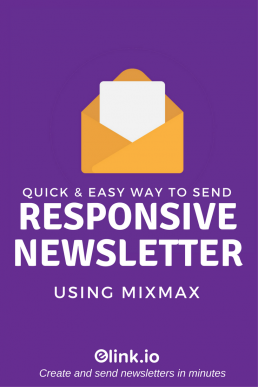 Copy the HTML code and get ready to export your newsletter to your Mixmax account. GET READY FOR YOUR MIXMAX NEWSLETTER! Go to your Mixmax account and click on compose. In the pop-up window, click on enhance and scroll down to “custom HTML” option. Paste your newsletter HTML code from elink.io in the window and voila! Your newsletter is ready to go! Mixmax and elink.io are a match made in heaven! This is pretty cool! I am definately going to use minmax. I needed to find a new way to send more expressive newsletters. Thank you! Great guide, I am still new at my newsletter so this helps ! Glad you liked it, Jenny 🙂 If you have any questions regarding elink-Mixmax newsletter integration, do let us know. I use MailerLite to send my newsletters and it’s great! This is still an informative post that will help others get started with Mixmax. After all, building your email list is so important. Awesome Kayleigh! All the best for your Newsletter! I will try to use mixmax. This is really a great guide. I love learning about new resources that I can potentially use in the future.